From classic movies to the Mississippi River to a meta map of the world's transit systems. A good transit map is like a party for your eyes, and everyone's invited. Maybe it's the intentional distortion that brings clarity to an otherwise confusing world. Maybe it's the sharp lines and fluid curves that transform a utilitarian document into a piece of wall art (or, at least, a T-shirt). Maybe it's just something cool that's not worth over-analyzing. In any event, we find transit maps so appealing that they're worth looking at even when they don't actually depict transit systems. Here are six great transit maps — from a chart of classic movies to a meta transit map of the world's transit systems — that are likable precisely because they have little to do with transit. This map, designed by David Honnorat, twists together 20 lines of classic cinema. A line of "universally acclaimed cinema" cuts through the center of the system, via the likes of The Godfather II, Star Wars, and Citizen Kane, as other genres from romance to gangster to animation spin off in various directions. A transit-film critic might point out that there isn't much rhyme or reason to the routes — they don't proceed chronologically, for instance — but the use of major films as hub stations is both a nice touch and a starting point for debate. The Sierra Club recently posted a transit map of America's national parks to its Facebook page. Within a reasonably tight frame the system stretches from the Gates of the Arctic in Alaska to the Florida Everglades to the Acadia in Maine (an asterisk points out the map is "so incredibly not to scale," in the unlikely event you thought otherwise). One noteworthy flourish is a dotted line, typically reserved for subway lines under construction, used here to depict a Yellowstone-to-Yosemite corridor that's best viewed in the summer. 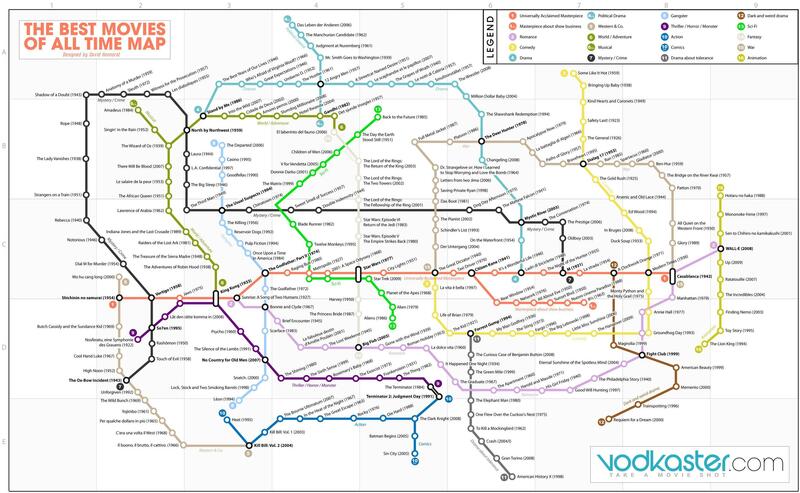 Several years ago Information Architects released a map of the 200 most successful 2.0 websites in the style of the Tokyo Metro. Font size is adjusted to represent the importance of certain stations — Google, Wikipedia, and YouTube appear to be the largest — and the lines are divided into subjects like News and Technology and Community. (Political Blogs are shown as commuter rail.) The designers also placed certain sites to reflect certain places in Tokyo: "Yahoo is in Ueno — a nice place, but nothing going on there." Last year cartographer Daniel Huffman posted a full line of "river maps" at his Something About Maps blog. His idea was for people to give rivers a modern, urban portrayal so he rendered them in the style of Harry Beck's map of the London Underground system. "The result is more of an abstract network representation than you would find on most maps, but it’s also a lot more fun," he writes. The maps range from the Mississippi River (shown here) to the Chesapeake Bay, and they're available for purchase, with a portion of proceeds going toward watershed protection. We've shown you Cameron Booth's subway-inspired map of the U.S. Highway System before, but it's certainly one worth seeing again. Booth created a Beck-style map of the interstates in 2009 then made one of the U.S. Highways in 2011. His creation is meticulously crafted — Booth's hubs favor road connections over populations, for instance — and so far it's also wildly popular. "The original Interstate map was definitely a comment on America's love affair with the automobile," Booth told us. "In a way, the Interstates are our transit system." The author Mark Ovenden, who published a comprehensive book of transit maps back in 2007 called Transit Maps of the World, brings us (via Flickr user Annie Mole) a fabulous meta transit map of the world's transit maps. The image represents rail systems that were either operating, planned, or under construction in 2008. Some of the connections are more logical than others — London and Sydney make sense on the same line, but what links Boston and Bucharest besides the "B"? — but there we go again, over-thinking something that's better just enjoyed.